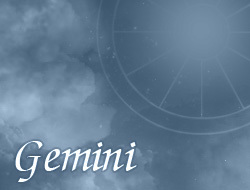 Easiness in establishing contacts with people it’s certainly one of major assets of Gemini. Persons with this zodiac sign are able to charm and attract almost every person – they have simply magnetic effect on people. Gemini have a wide range of interests, which translates to their knowledge – thanks to that they always find topic for conversation, and hence very easily and quickly establish contact with people. They often belong to persons, who can pick up the second half and enchant with their charm and eloquence. Repeatedly they are able to surprise their partner with something positive, thus their partner certainly won't feel boredom and routine in the relationship. Starting a family take very seriously and responsibly – they want to build it based on mutual love, sense of security and stability in the life. Gemini belongs to persons almost inseparable, therefore are able to build long and strong relationships that can survive various ups and downs. They love people very much; therefore the family is more important than money and career for them.